Our hands take a lot of abuse. Exposed to harsh detergents, hot water, sun and wind on a daily basis, sensitive skin can become dry, red and creased – all signs of premature aging. Nails are part of the package, and continuous pounding on a keyboard or one of the other million ways we use our digits each day can leave nails in rough shape. When funds are low, or if you would simply prefer to spend your hard-earned money somewhere other than at a pricey salon, you can make a complete hand spa treatment at home instead. Lemon juice is a natural bleaching agent that won’t burn skin and smells a lot better than chlorine. Just squeeze the contents of a fresh lemon into a non-metallic bowl and soak your nails, one hand at a time, for five minutes each. The goal is to create nice “whites” at the ends of your fingers. Well-groomed cuticles not only demonstrate care in your appearance, but also make nails appear longer. After soaking nails in lemon juice, dab a drop of cuticle oil or hand lotion onto each cuticle and massage in to soften the skin. This will make it easier to manipulate your cuticles. Using the blunt, flat end of a stainless steel cuticle pusher/nail cleaner, gently push back cuticles, taking care not to slip with the tool and cause injury. You've pushed cuticles back far enough when a half-moon is visible. This is the lunula, the part of the nail bed that manufactures the cells that form the nail plate. A simple scrub made from 1/2 cup organic sugar, 1/4 cup organic coconut oil and 1/4 cup organic honey will exfoliate skin and encourage new cell growth. Add 15 to 20 drops of lavender, sweet orange or other essential oil, if you wish. To use, spread a tablespoon of this mixture onto one hand with the other. Rinse well and repeat on the other hand. Pat skin dry. Using a cotton ball or soft cloth, massage a drop or two of oil onto each cuticle. Blot dry with a second cotton ball or cloth. Sweet almond oil is a good choice because it’s readily absorbed into the skin and won’t leave you with greasy fingers. In a pinch, olive oil works too. A hand massage calls for a light but moisturizing lotion. 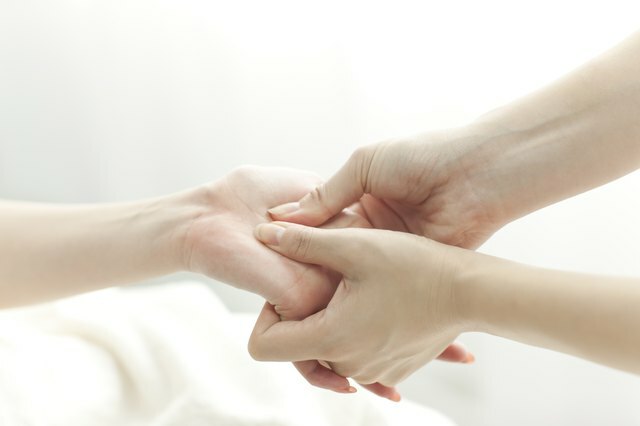 Whether you perform this part of the treatment yourself or enlist another to do it for a real melt-in-your-seat response, the massage should include circular motions for the tops of each hand, with special attention given to each knuckle and joint. Use an all-natural organic lotion, if possible. Most conventional lotions contain artificial fragrance, petroleum products and preservatives. One class of preservatives, parabens, are of particular concern because they're suspected endocrine disruptors. 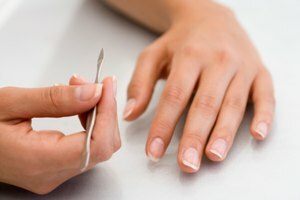 If you wish to add color to your nails as part of your hand spa treatment, aim for a nail polish labeled with the word “free” preceded by a number, which refers to the number of potentially toxic ingredients it doesn’t have in it. The first of these to hit the market were called “3-Free” nail polishes, indicating the absence of formaldehyde, toluene and dibutyl phthalate (DBP). Now there are 5-Free through 9-Free polishes, for which you can add, depending on the number, parabens, formaldehyde resin, ethyl tosylamide, camphor, xylene and acetone to the list of ingredients that aren’t there. Be aware that as the number range of the product increases, so does the price tag. Washington Post: Are Parabens and Phthalates Harmful in Makeup and Lotions?